It’s quite simply yeasts that convert the sugars in your fruit juice (called the must in the jargon) to alcohol and carbon dioxide. Yeasts are tiny organisms that are floating around in the air and if you just leave a cup of grape juice on the side in the kitchen, within hours it will have some yeasts in there. 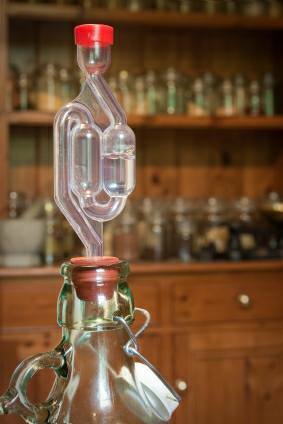 Unfortunately there are many types of yeast and wild yeasts are more likely to produce vinegar than wine. That’s why you buy your yeast for wine making. Wine yeasts have been developed to withstand a high level of alcohol over the years and you can just buy an all-purpose wine yeast. When you begin to get more confident and develop the art you will move on to specialised varieties, Burgundy, Chablis, Hock, Sauternes and Champagne yeasts to name but a few are available. Don’t be tempted to use bread yeast, trust me, it doesn’t work for wine! Because of the wild yeasts, it is critical that you maintain the highest standards of cleanliness and sterilise your equipment. You cannot skimp on this or you’ll end up with a lot of vinegar at best . Before you start making wine it is critical that you sterilise everything you will be using. We start by giving everything a good wash in hot soapy water. With demijohns we use a long bottle brush to get into the corners and another brush for the bottles. Next we rinse off with clean water and everything should look sparkly clean. At this stage things are NOT sterile though. There are still wild yeasts and microbes about so it’s time to soak in a sterilising solution. You can use Campden tablets but the specific cleaning / sterilising chemicals do a better and more thorough job for this task. If you didn’t clean your equipment thoroughly after the last time you used it then you may need to leave things to soak for an hour or even over night. A bottle brush, especially the long handled type that can get into the corners of a demijohn is a must. They only cost a couple of pounds but last for years.